On Thursday 15th August, 1872, the 1.30 p.m. passenger train from Victoria station, London, 3.27 p.m. from Eastbourne for Hastings, was turned through a pair of points in the wrong direction, after starting from Eastbourne station, and ran into the line leading to the turntable, in place of continuing its journey along the main line. Four passengers have complained of injury, and the guard of the train was also injured. length; and at 52 yards on the cost of the east end of it there are o pair of points (numbered 7 in the enclosed diagram) leading from the main line towards the engine shed and turntable. 120 yards from the east end of the same platform there is a signal-cabin, provided with a locking frame, from which all the points and signals in the neighbourhood are worked, 11 levers being used for working the points and 14 for working the signals. The points above specially referred to were, at the time of the time of the accident, worked from this cabin; but the lever by which they were worked had not been interlocked with the signals, the locking apparatus not having been completed. The 3.27 p.m. train left the Eastbourne station about 3.50 p.m. on the afternoon in question, consisting of an engine and tender, nine passenger carriages, a dummy van, and two break vans one in the front, and the other in the middle of the carriages. The engine driver received from the station master the usual order to start, and the signal was lowered from the signal cabin for him to run out of the station. The engine driver did not notice the condition of the turntable points as he approached them at a speed of eight miles an hour, but had no sooner passed over them than her heard some one shouting to him from the permanent way and he found he was running along the turntable road, in place of continuing his journey along the main line. He had just time to sit off steam and reverse his engine when it ran forward over the girder of the turntable, which was not in perfect condition, as the roads leading to it were in course of alteration. The rails of the turntable not having been in a line with the wheels of the engine, the engine ran partly across it, and as far as the other end of it; some of the wheels of the engine running over both rails of the turntable. The tender, following the engine, slipped off the turntable on the south side of it; the guard’s van next behind the tender fell in on the south side of the turntable; and the first class passenger carriage behind the van, pushing the van forward, tilted it up, and they remained, the van with its trailing end, and the passenger carriage with its leading end, up in the air. The second class carriage next behind the first class carriage had its end damaged, in consequence of trailing end of the first class carriage falling as the leading end of it was tilted up, the remaining vehicles of the train remaining on the rails of the turntable road. The leading axle of the engine was bent, and the leading guard’s van was very much damaged; but besides the first, and second class carriages behind it, there was no damage done to the train, and the same vehicles went forward to Hastings. 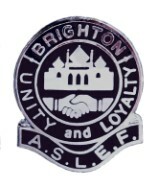 The signalman who was on duty in the cabin is an experienced man, having done duty as signalman for six years with the Brighton Company. He admits having lowered the signal for the train to leave the Eastbourne station. When the train arrived from London the engine was detached from the front of it, was disengaged from it by running along another line rails towards the turntable, was taken on the turntable, and turned round, and was run back to be re attached to the east end of the train ready for its departure for Hastings. After the signalman had worked the points for the engine to go into and out of the turn table line, he pushed back, as he thought, the points leading to the turntable line but he states that he got hold of the wrong lever, and pushed that lever back in place of the lever of the turntable points, before lowering his signal for the departure of the train. He did not find out his mistake until he saw the engine running along the turntable line, and it was then too late for him to do anything by which the accident could be avoided. The signalman is a man of good character, and frankly admits his mistake. He made this mistake in the absence of locking arrangements which were in progress, and which have prevented it. 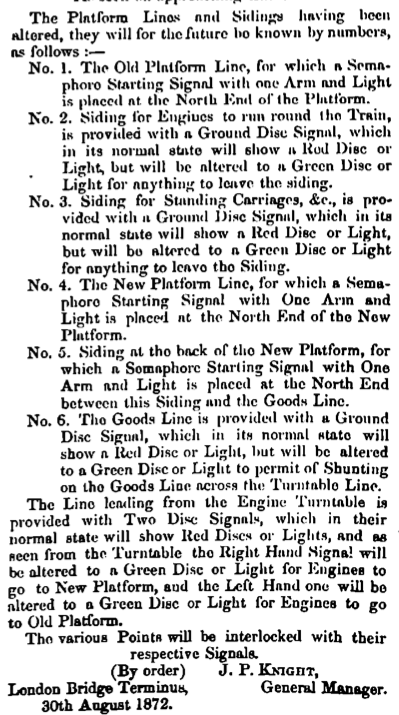 These locking arrangements are being completed as speedily as possible, and when they are completed (which will be in the course of the present week) it will be out of the power of the signalman to make a mistake of the same description. The growing importance of the town of Eastbourne has occasioned a great increase in the traffic to and from the town. 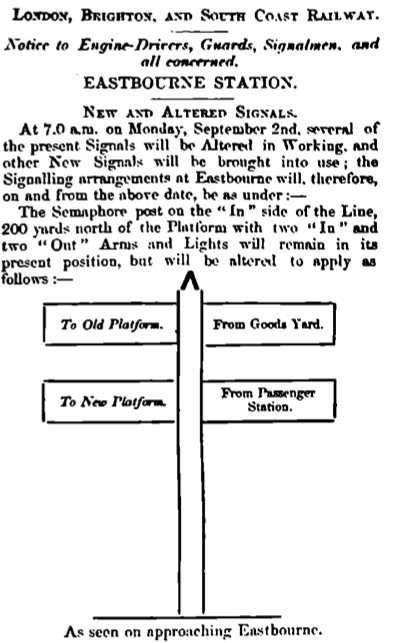 To meet this state of things the Company have been not only improving the station arrangements, as above described, but have also, at further considerable expense, constructed a spur line, by means of which the Eastbourne traffic is conducted through carriages from London, and worked through without change of carriage between London and Hastings. They have also, I am informed, jus completed their arrangements for working their line on the block system for the whole distance between London and Eastbourne.